In advance of tomorrow's publication by John Redwood of the Conservative Party's Economic Competitiveness Review, the Daily Mail has been leaked details which strongly suggest that the Shadow Chancellor, George Osborne, will accept the recommendation to radically reform inheritance tax, by excluding the main home from the 40 per cent levy. 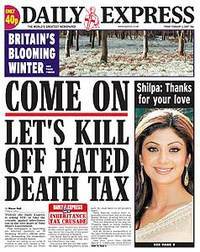 The death tax is one of Britain's most hated taxes, and led to a mass 300,000 name petition organised by the Daily Express in 2006 calling for its abolition. Our own extensive polling last August found that it ranked only behind council tax as the most unpopular tax. Just to reiterate the TPA stance on inheritance tax: we think it is immoral, unpopular, unfair and unnecessary - and should be abolished. 1. Immoral because the State should have no extra claim on your assets by virtue of the fact that you have the misfortune to die - something most of us don't plan. A complex tax that was designed for the rich now hits ordinary people when they least expect it and when it does most to worsen their stress and bereavement. Lord Lipsey wrote in the Guardian that IHT is only paid by the “the unwise or the unlucky” – how can such a tax be moral or defensible? 2. Unpopular because in poll after poll (including ones for the TPA), IHT ranks as one of the most hated taxes, right across the country (even areas like the North East where house prices haven't dragged as many people into the death tax net). People instinctively understand the immorality and unfairness of IHT on principle, whether or not they expect to pay it themselves. 3. Unfair because it represents double-taxation at least and more often than not triple-taxation - money that is earned is taxed once, and then taxed again when it is invested (stamp duty on a house purchase) and then taxed a third time on the proceeds of an estate at 40% through IHT when the owner dies. Raising the thresholds at which the tax is paid, or reducing the rate or both, would obviously help but only out-right abolition would address the unfairness issue. 4. Unnecessary because despite the harm it causes to thousands of families every year, IHT raises only £3.6 billion for the Treasury – less than 1% of total tax revenue. Waste and unnecessary spending could easily be sourced to cover the cost of abolishing this tax (The European Central Bank estimates that more than £80 billion of unnecessary government spending goes on in the UK). Also, countries around the world are abolishing death taxes - Australia doesn't have it (abolished in 1976! ), Sarkozy in France is looking to scrap it, even social-democratic Sweden has abolished it. It is an unnecessary relic of a c19th tax system that has no place in a modern economy. For all of these reasons, the TaxPayers' Alliance favours nothing short of abolition and we do not believe it is necessary (and certainly as a low-tax campaign group not desirable) to have anything in its place. Although the proposal is not a complete abolition of Inheritance Tax, by excluding the main home it will go a long way towards addressing the injustice of the death tax faced by millions of ordinary families across the country. Hopefully David Cameron will listen to John Redwood and commit the Conservatives to this proposal and we congratulate the Economic Competitiveness Commission and Lord Forsyth’s Tax Reform Commission, which first came up with the policy. That said, this announcement from John Redwood is very encouraging because it shows that the Conservatives are starting to understand that Britain's growing tax burden is hitting families as well as businesses.